Colorado notary law authorizes a notary to notarize a Proof of Execution by Subscribing Witness. This is a rarely used and mostly unknown notarial act. It is not taught in basic notary training, nor described in the notary laws. The process is described under Colorado real estate law, CRS 38-30-136, Subsequent Proof of Execution. The document signer does not appear before the notary. Instead, a subscribing witness to the document appears before the notary and makes a sworn statement about the document execution by the signer. (1) When any deed or instrument of writing has been executed and not acknowledged according to law at the time of the execution thereof, such deed or instrument of writing may at any subsequent time be acknowledged by the makers thereof in the manner provided in this article, or proof may be made of the execution thereof before any officer. Such officer, when the fact is not within his own knowledge, shall ascertain from the testimony of at least one competent, credible witness, to be sworn and examined by him, that the person offering to prove the execution of such deed or writing is a subscribing witness thereto. Thereupon such officer shall examine such subscribing witness upon oath or affirmation, and shall reduce his testimony to writing and require the witness to subscribe the same, endorsed upon or attached to such deed or other writing, and shall thereupon grant a certificate that such witness was personally known or was proved to him by the testimony of at least one witness (who shall be named in such certificate) to be a subscribing witness to the deed or instrument of writing to be proved, that such subscribing witness was lawfully sworn and examined by him, and that the testimony of the said officer was reduced to writing and by said subscribing witness subscribed in his presence. (2) If by the testimony it appears that such witness saw the person, whose name is subscribed to such instrument of writing, sign, seal, and deliver the same or that such person afterwards acknowledged the same to the said witness to be his free and voluntary act or deed and that such witness subscribed the said deed or instrument of writing in attestation thereof, in the presence and with the consent of the person so executing the same, such proof if attested and the authority of the officer to take the same duly proved in the same manner as required in the case of acknowledgment, shall have the same force and effect as an acknowledgment of said deed or instrument of writing by the person executing the same, and duly certified. 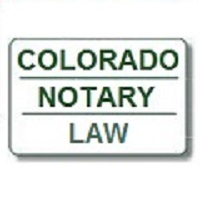 There is no sample notarial certificate for a Proof of Execution shown in Colorado law. Research found an old example from Cowdery’s Form Book, Legal and Commercial, 1918. The National Notary Association (NNA) also includes information and a sample notarial certificate for a Proof of Execution in their Notary Home Study Course, Chapter 11: Proofs of Execution. Please see the attached Colorado Proof of Execution Certificate reference document for more information and a sample notarial certificate for a Proof of Execution. Make sure the document recipient is aware of the special procedure required when a Proof of Execution is used, rather than the commonly used acknowledgment.